The Wunderlich Syndrome refers to spontaneous perirenal hemorrhage often associated with underlying renal pathology. We report the case of a 23-year-old female with advanced tuberous sclerosis who presented in hypovolemic shock secondary to rupture of one of her massive bilateral angiomyolipomas (AMLs). The patient was able to be managed conservatively and subsequently retained full renal function. A review of the literature with a discussion of types of clinical presentation, diagnostic criteria, and methods of management of AMLs is included. Spontaneous perirenal hemorrhage, known as the Wunderlich Syndrome (WS), is often associated with underlying renal pathology, including angiomyolipomas (AMLs). We report the case of a 23-year-old female with tuberous sclerosis (TS) who presented with the WS secondary to a ruptured giant AML. We discuss the relationship between TS and AMLs as well as their patho-physiology, clinical presentation, and management. A 23-year-old female with a known diagnosis of advanced TS presented to the emergency department with hypotension and right-sided back pain. A complete blood count revealed hemoglobin of 5.2 g/dL and mean corpuscular volume (MCV) of 60 fL, compatible with acute hemorrhage. A computed tomography (CT) scan of the abdomen and pelvis was performed with intravenous contrast. The scan revealed massive bilateral renal AMLs with evidence of retroperi-toneal hemorrhage. The renal architecture was vastly distorted, with the right AML measuring 31 × 11 × 19 cm and the left AML measuring 14 × 8 × 4 cm ([Figure 1], [Figure 2] and [Figure 3]). 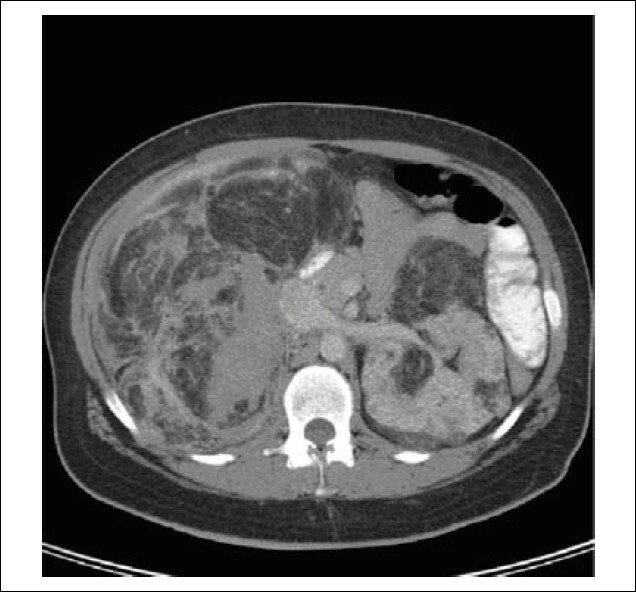 Figure 1: CT scan of the abdomen showing massive right renal angiomyolipoma measuring 31 × 11 × 19 cm. 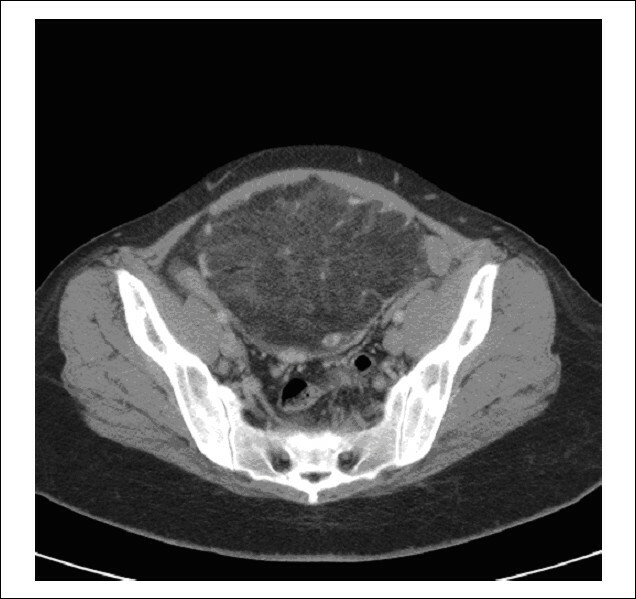 Figure 2: CT scan of the abdomen showing a giant right renal angiomyolipoma extending below the pelvic brim occupying most of the pelvis. 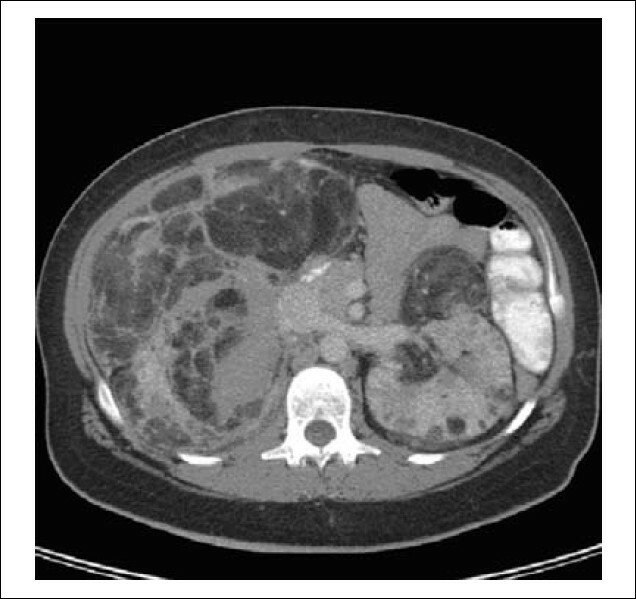 Figure 3: CT scan of the abdomen showing spontaneous retroperitoneal hemorrhage anterior to Gerota's fascia secondary to massive right renal angiomyolipoma. The patient responded to fluid resuscitation and was admitted to the hospital and transfused to keep her hemoglobin greater than 8 g/dL. Urology and interventional radiology were consulted for possible arterial embolization. Fortunately, the patient remained hemodynamically stable without a decrease in hemoglobin over the next two days; thus, she was managed conservatively without further intervention. The WS refers to spontaneous perirenal hemorrhage often due to inherent renal pathology. The most common cause of this condition is neoplasia, especially renal cell carcinoma and AMLs. Although AMLs can arise spontaneously, they are often associated with TS. AMLs that are associated with TS are more likely to be larger and more prone to spontaneous retroperitoneal hemorrhage. AMLs presenting with the WS may be managed conservatively if the hemorrhage is self-limiting, but selective arterial embolization and even nephrectomy may be necessary in cases of continued hemodynamic instability. Because of this, a high level of suspicion should be mainained in any patient with TS who presents with flank pain and hypotension. 1. Osborne JP, Freyer A, Webb D. Epidemiology of tuberous sclerosis. Ann N Y Acad Sci 1991; 615:125-7. 2. Curatolo P, Bombardieri R, Jozwiak S. Tube rous Sclerosis. Lancet 2008;372:657-68. 3. Freyer AE, Chalmers A, Connor JM, et al. Evidence that the gene for tuberous sclerosis is on chromosome9. Lancet 1987;1:659-61. 4. KAndt RS, Haines JL, Smith M, et al. Linkage of an important gene locus for tuberous sclerosis to a chromosome 16 marker for polycystic kidney disease. Nat Genet 1992;2:37-14. 5. Smythe JF, Dyck JD, Smallhorn JF, Freedom RM. Natural history of cardiac rhabdomyoma in infancy and childhood. Am J Cardiol 1990; 66:1247-9. 6. Ewalt DH, Sheffield E, Sparahana SP, Delgado MR, Roach ES. Renal lesion growth in children with tuberous sclerosis complex. J Urol 1998;160:141-5. 7. Wagner BJ, Wong-You-Cheong JJ, Davis CJ Jr. Adult renal hamartomas. Radiographics 1997;17:155-69. 8. Oesterling JE, Fishman EK, Goldman SM, Marshall FF. The management of renal angiomyolipoma. J Urol 1986;135:1121-4. 9. Harabayashi T, Shinohara N, Katano H, Nonomura K, Shimizu T, Koyanagi T. Management of renal angiomyolipomas associated with tuberous sclerosis complex. J Urol 2004;171: 102-5. 10. Kobayashi M, Nakano K, Nukui A, Goto K, Morita T. Bilateral Massive Renal Angiomyolipoma Concurrent with Oncocytoma in Tuberous Sclerosis Complex Assoicated with Pulmonary Lymphangioleiomyomatosis. Urology 2008;72:948.e7-9. 11. Yamakado K, Tanaka N, Nakagawa T, Kobayashi S, Yanagawa M, Takeda K. Renal angiomyolipoma: relationships between tumor size, aneurysm formation, and rupture. Radiology 2002;22578-82. 12. Ruiz C, Velazquez E, Creixell C, Barja J, Palacio EV, Rosello A. Wunderlich syndrome secondary to the rupture of an aneurysm of the renal artery. Review of the literature. Arch Esp Urol 1992;45:417-20. 13. Morgentaler A, Belville JS, Tumeh SS, Richie JP, Loughlin KR. Rational approach to evaluation and management of spontaneous perirenal hemorrhage. Surg Gynecol Obstet 1990;170: 121-5. 14. Albi G, del Campo L, Tagarro D "Wünderlich's syndrome: Causes, diagnosis and radiological management". Clin Radiol 2002;57:840-5. 15. Chesa Ponce N, Artiles Hernández JL, Ponce Socorro JM, del Rosario Medina J, Castro López-Torrella V, Betancort de León R. Wunderlich's Syndrome as the first manifest-tation of a renal angiomyolipoma. Arch Esp Urol 1995;48:305-8. 16. Parameswaran B, Khalid M, Malik N. Wunderligh Synderome rollowing rupture of a renal angiomyolipoma. Ann Saudi Med 2006;26: 310-2. 17. Hao LW, Lin CM, Tsai SH. Spontaneous hemorrhagic angiomyolipoma present with massive hematuria leading to urgent nephrectomy. Am J Emerg Med 2008;26:249.e3-5.